Good preparation for your trip to Venice Italy is studying the Venice weather forecast. "The City of Water" is in the north of Italy on the lagoon of Venice, which is bordered on the northeast by the Adriatic Sea. Venice has 118 small islands between the mouths of the Po and the Piave River. Venice has a warm humid temperate climate with hot summers and no dry season. Because the city is floating on a web of canals it is subject to high humidity throughout the year. In combination with the summer heat, this can lead to uncomfortable conditions. Despite this, July and August are the peak tourist crowds. So, if you choose to brave the heat, humidity and the throngs of tourists, go and book a hotel in advanced! 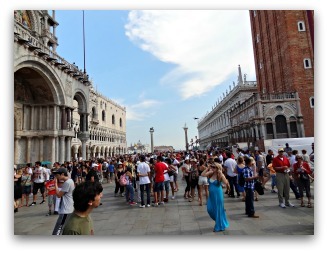 July is the hottest month in Venice with an average (day + night) temperature of 23°C (74°F). But the temperature you feel can be much warmer. You can calculate + 5°C due the humidity, sunshine reflecting the water and stones. The coldest month is January with an average of 3°C (37°F). The month July has the most daily sunshine hours. The wettest months are June and November, with an average of 90mm of rain. Summer in Venice starts in June with temperature peaks in July and August. The temperature rises between 30°C (86°F) and 40°C (104°F). Luckily, the summer also has rain for some refreshment but this happens occasionally. The high temperatures and humidity means that there are frequent thunderstorms. A thunderstorm can disrupt your travel plans, but it gives a romantic picture with the drops of rain pattering on the canal. July is the sunniest month of the year with nine hours of sun per day. The best month to swim in the sea is in August. The average sea temperature is 26°C (79°F). You can swim on the long stretched beach of the island ‘Lido’ (15 minutes by vaporetto boat). 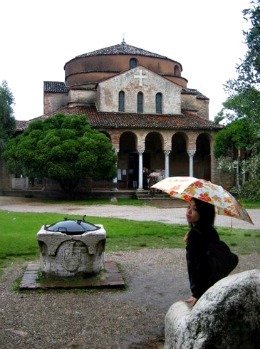 Light rain showers that last for hours are typical for a winter in Venice Italy. The coldest month is January with an average temperature of 6°C (42°F) during the day and an average of 1°C (33°F) in the night. The months February and December are just a bit warmer. The Adriatic winds are bitterly cold as they blow over the waters of the city. Come and prepare with gloves, scarves and a warm jacket if you plan to visit the city in the winter. There are also bright, sunny days in the winter, perfect for sightseeing. In these two seasons the weather changes often. Closer to the summer, it is pleasant with warm days and cool nights. May has an average temperature of 21°C (70°F) during the day and an average temperature of 12°C (54°F) at night. The best time to visit the city is in the months April till June or the months September and October. During these periods the peak of the tourist season is avoided. You also have less problems with humidity and winter conditions. The tourist season lasts from June 4 till September 13th. The hottest day of the year is July 29th. The cold season lasts from November 22 till March 5th. The coldest day of the year is January 9th. The earliest sunrise is at 5:21 on June 12 and the latest sunset is at 21:04 on June 29th. The latest sunrise is at 7:51 on January 2 and the earliest sunset is at 16:27 on December 10. You've read about my Venice weather forecast. There is plenty to explore, as you can read. 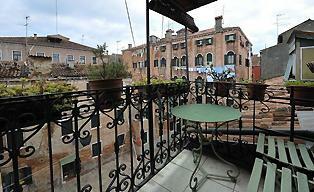 Share my site on Venice and get more information.